Located In: City of Cottage Grove, Washington County. 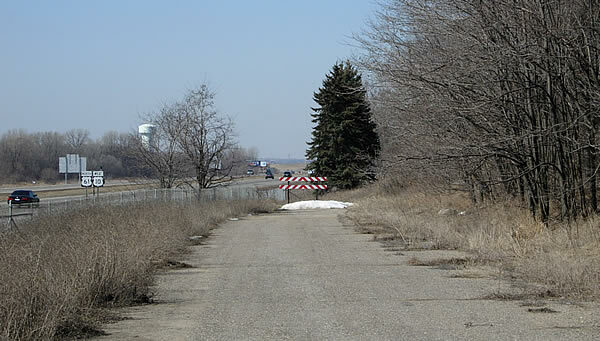 A short section of Point Douglas Road south of 80th Street in Cottage Grove still uses the alignment of the original paved highway between St. Paul and Hastings. The surviving section was once part of a much longer service drive that stretched from Hefner Avenue on the south, to almost a half mile past 80th Street on the north. 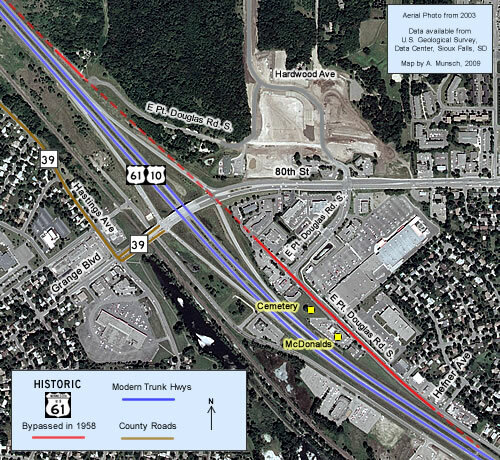 The surviving stretch of the alignment was originally paved with 18 feet of concrete. The section north of 80th Street was completed in 1925; the section to the south was completed in 1927. 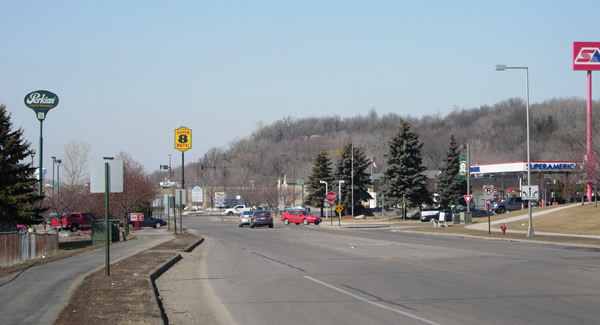 The original road was replaced in 1958 when U.S. 61/10 through Cottage Grove was upgraded into a divided highway. There were nothing but farms and a cemetery along the service drive in 1958. Over the next 50 years the area was transformed into a busy retail district. A 1964 aerial photo shows that the service drive was extended south as part of nearby residential development. The original concrete pavement was also eventually paved over. In 1983 MnDOT constructed the 80th Street/Grange Boulevard interchange. Roughly half of the service drive was demolished to make room. Only a tiny section survived at the very northern end (this section is now either inaccessible or gone due to the construction of White Pine Senior Living of Cottage Grove). The remaining section south of 80th Street was capped with a cul-de-sac. Today, only the cemetery remains as a reminder of the area's rural roots. The old road has been extensively rebuilt and widened to handle the increased traffic. Photo Tour - All photos taken in March, 2007. Looking north at the northern end of E Point Douglas Road. 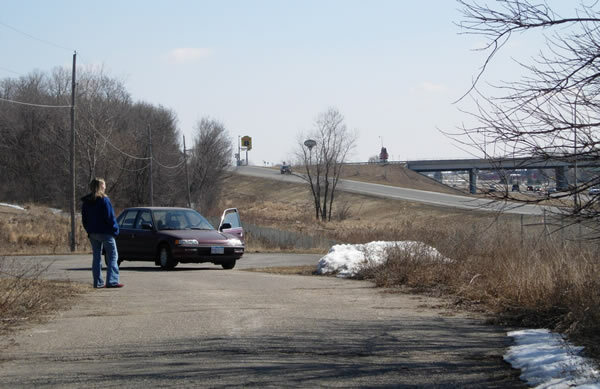 This tiny section of the old highway was paved over in 1958 to serve as the entrance to the main highway at the north end of the former service drive. Note the route markers on the left. Looking south toward the 80th Street interchange, which wiped out the connection to the rest of the old alignment in 1983. Note the alignment of the utility poles.The cul-de-sac at the end of E. Pt. Douglas Road marks where a temporary intersection and traffic signal were constructed to serve as a bypass of the main highway while the interchange was under construction. The cul-de-sac is now gone, removed to make way for the construction of a senior living center. Looking north from the McDonalds parking lot down E. Pt. Douglas Road. 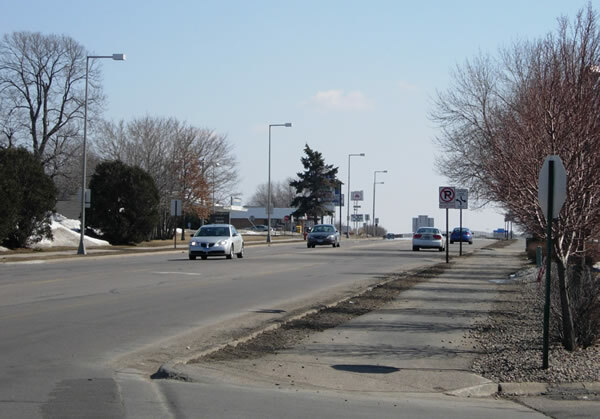 This section of the old highway was fully reconstructed after 1983 to serve the now busy commercial area around 80th Street, erasing all signs that this was the original alignment of U.S. 61. Looking south from the the McDonalds parking lot down E Pt. Douglas Road. The old highway continued straight ahead in the distance onto the alignment of the modern road. 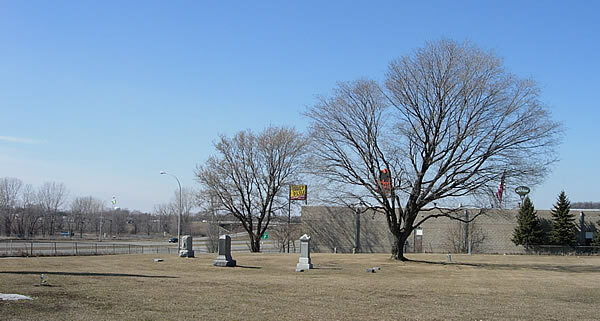 The rural cemetery, as seen (ironically) from the McDonalds parking lot.